A recent visit to a rehabilitation center and observing patients with large tablets leaning on their laps and stomachs led me to write this article about tablet mounts for hospital beds. A tablet with an internet connection is important for someone spending some time away from home. It helps to stay connected and see what’s going on in the world. Downtime in a rehab center is long and boring. Having a tablet allows the patient to keep in touch via email or FaceTime. It provides some entertainment with news and game apps. You can even watch TV with the Comcast application. The problem is that a tablet can be heavy and awkward, especially with a case on it. If it’s being used to watch the ball game, holding it for over two hours is impossible. That’s the reason for this article. The important attributes for a good tablet mount for beds is the ability to attach to a rail and to remain steady when the patient is interfacing with it. Most hospital beds have a rail attached to the sides. The diameter of the rails will typically be around an inch. Some will be more, some less. Measure it to be sure. Remember that the diameter is the distance from one side to the other, not the circumference which is the distance around the bar. I mentioned the ability to remain steady in last paragraph. Put some thought as to the application that be used and the patients requirement to interface with the tablet. You will want the mount to hold still when interfacing with the tablet. In other words, you don’t want it to fall out of the mount when it’s being used. You also should put some thought into how often the mount will need to be moved. Think about details regarding frequency of installation or removal and the potential need to bend it out of the way without detaching the mount. 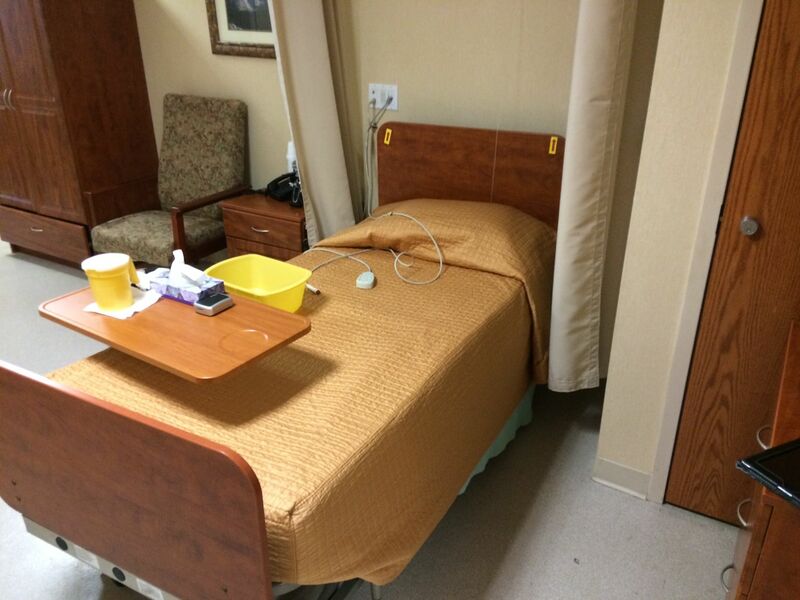 A great option for hospital beds is a gooseneck mount. Most gooseneck mounts come with a clamp or vice type of attachment. The Arkon Gooseneck Tablet Clamp is a nice example of a well made mount that works well on a hospital bed . The bottom vice opens to over 2 inches and the 12″ gooseneck is stiff enough to hold up when you are using your tablet. A nice feature of the gooseneck is that you can bend it out-of-the-way when getting in and out of the bed. The accompanying cradle is a universal expandable model which opens wide enough to fit most tablets. The cradle pivots and swivels. Another option from the same company as the gooseneck comes with the same cradle. The Arkon Heavy Duty Tablet Mount is made of metal and is more rigid that the gooseneck model we just discussed. The clamp opens to 1.5 inches. There are adjustment points at the base, midway and again at the cradle. The cradle pivots and swivels. An interesting mounting option is the Lapworks Armbot Mount. Although more expensive than the other mounts already discussed, it provides a greater reach and more adjustment points. The mount can be customized by adding or removing arms based upon the amount of reach or adjustment needed. With all included arms attached, the mount can expand over 37 inches. That’s clear across the bed. The included expandable cradle opens to accommodate most tablets. Finally, one last recommendation for a good mount is one that doesn’t attach to the bed at all. The LEVO Floor Stand is a nice option if you have the room for it. Just place the stand portion under the bed. The cradle swivels from portrait to landscape. The height spans from 30 to 56 inches. Height extensions are available but if you are using this for hospital bed, this should suffice nicely.